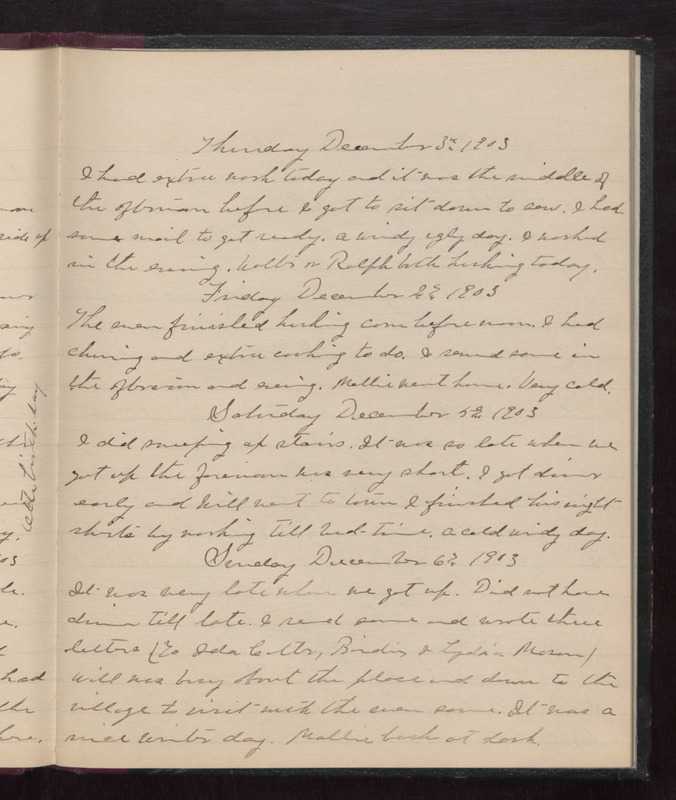 Thursday December 3rd 1903 I had extra work today and it was the middle of the afternoon before I got to sit down to sew. I had some mail to get ready. a windy ugly day. I [washed?] in the evening. Walter & Ralph both husking today. Friday December 4th 1903 The men finished husking corn before noon. I had churning and extra cooking to do. I sewed some in the afternoon and evening. Mollie went home. very cold. Saturday December 5th 1903 I did sweeping up stairs. It was so late when we got up the forenoon was very short. I got dinner early and Will went to town. I finished his night shirts by working till bed-time. a cold windy day. Sunday December 6th 1903 It was very late when we got up. Did not have dinner till late. I read some and wrote three letters (to Ida Colter, Birdie & Lydia Mason). Will was busy about the place and down to the village to visit with the men some. It was a nice winter day. Mollie back at dark.